The drawing is now closed. Congrats to Robert Mirman from Charlotte, NC who won the device. 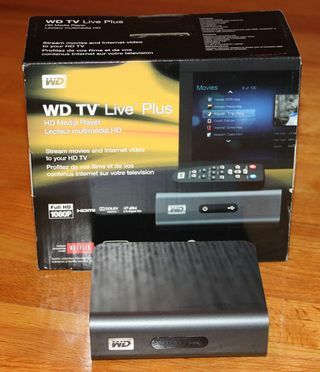 Up for grabs is a Western Digital WD TV Live Plus streaming player that I'm giving away for free. To enter the drawing, all you have to do is leave one comment on this post and make sure you submit the comment with a valid email. The drawing is open to anyone with a mailing address in the U.S. and I will select one winner at random in about two weeks. Good luck! For a more detailed review of the WD TV Live Plus, Roku, Apple TV and Sony SNP-N100, check out my post entitled: "Device Comparison: Apple TV vs. Roku vs. WD TV Live Plus vs. Sony SMP-N100."